Did you know that there are more than 4 million couples cohabiting in the UK. In Northern Ireland more couples are deciding to live together outside of marriage or civil partnership. 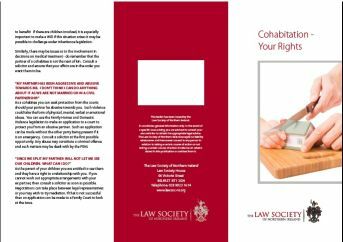 The Law Society of Northern Ireland have this week launched a new leaflet which aims to provide guidance and information on a number of issues which affect cohabiting couples everyday. Unfortunately these problems which arise as the consequences of living together are often far reaching, overlooked and mostly legal. As elsewhere in the United Kingdom, cohabiting couples in Northern Ireland seldom seek legal advice until their relationship is in crisis. This, together with the misconception that cohabiting couples acquire rights equivalent to marriage or civil partnership after a period of time, can leave couples in a vulnerable position. 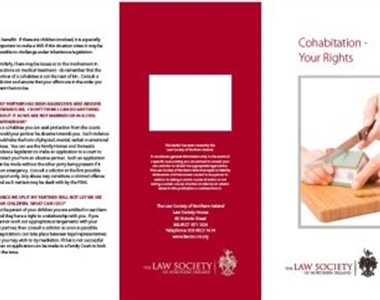 In response the Law Society has produced the following publication to advise the public particularly couples that you should seek professional legal advice whether they are entering a cohabitation relationship, or indeed if the relationship has ended and there are issues to be resolved. A solicitor will be in a position to answer all your questions and indeed advise you generally.